A New Map of Germany, divided into Circles, from the Best Authorities. 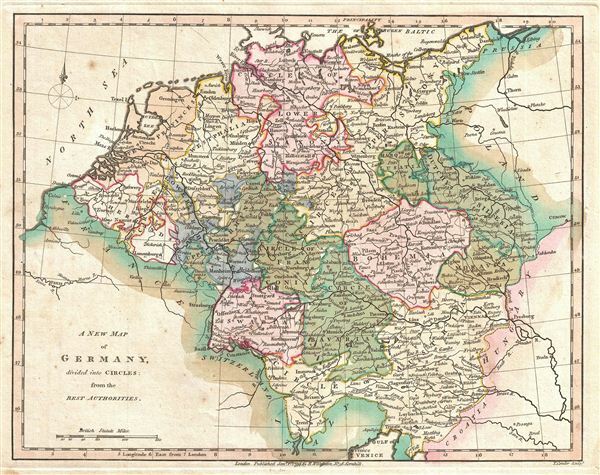 A finely detailed first edition 1794 map of Germany by Robert Wilkinson. The map covers all of modern day Germany and Austria, and divides the area into the imperial circles devised by the Holy Roman empire to administer, tax, and defend the empire (covering most of what is now Central europe). engraved by Thomas Conder for the 1794 first edition of Robert Wilkinson's General Atlas.